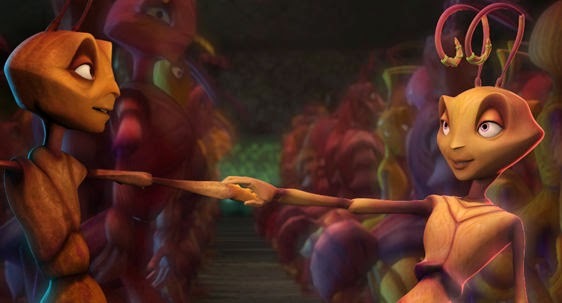 All of Your Favorite Stars Frolic in DreamWorks' "Antz"
Pixar had revolutionized the field of animation with its completely CGI 1995 "Toy Story," and startup DreamWorks Animation (formed in 1994 by Steven Spielberg, Jeffrey Katzenberg and David Geffen) saw the opportunity it presented. 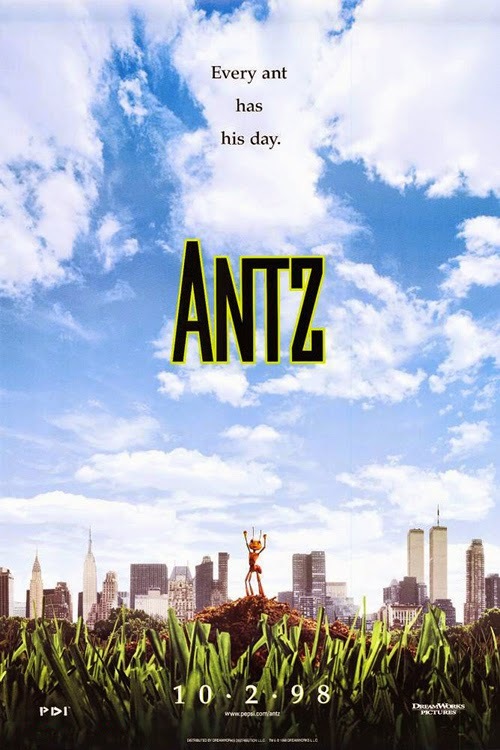 It put together as its first animated feature film "Antz" (1998), directed by Eric Darnell and Tim Johnson and written by Paul Weitz, Chris Weitz and Todd Alcott. 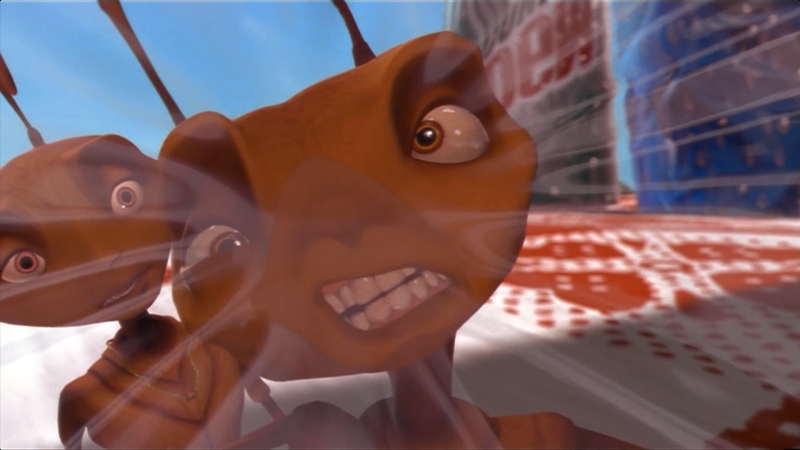 Completely CGI animation, "Antz" cost $105 million and was a major bet by the studio that the public was hungry for films made with the new technology. The bet paid off handsomely and established the fledgling studio as a major player. 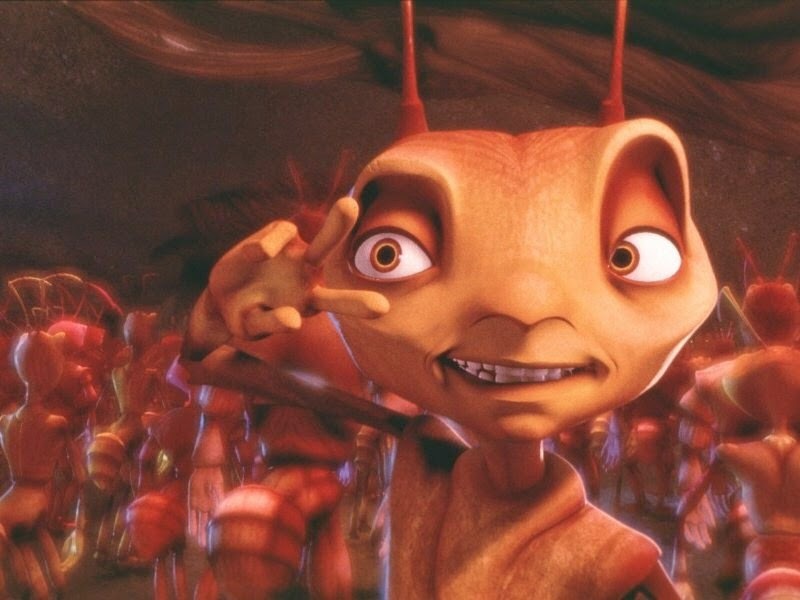 The real story behind "Antz," though, is that it was a pawn in a larger chess game being waged by DreamWorks studio head Katzenberg against his rivals. A former chairman of the Disney film division, he had contacts throughout the industry and used them unapologetically to his own advantage. Disney was the distributor for Pixar's films at that time, and Katzenberg had a good relationship with John Lasseter at Pixar. Katzenberg pumped Lasseter for information about Pixar's next project after "Toy Story," which was "A Bug's Life." 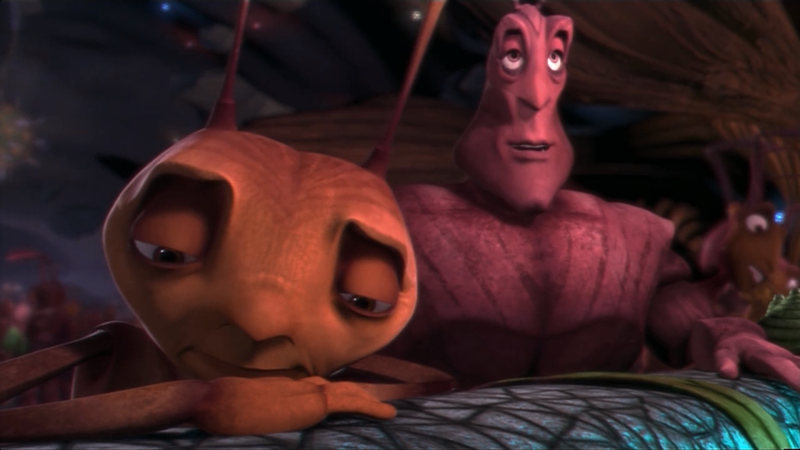 Soon, DreamWorks was rushing its own story about bugs to the screen, which Lasseter did not feel was a coincidence and which led to a lot of hard feelings in the industry. 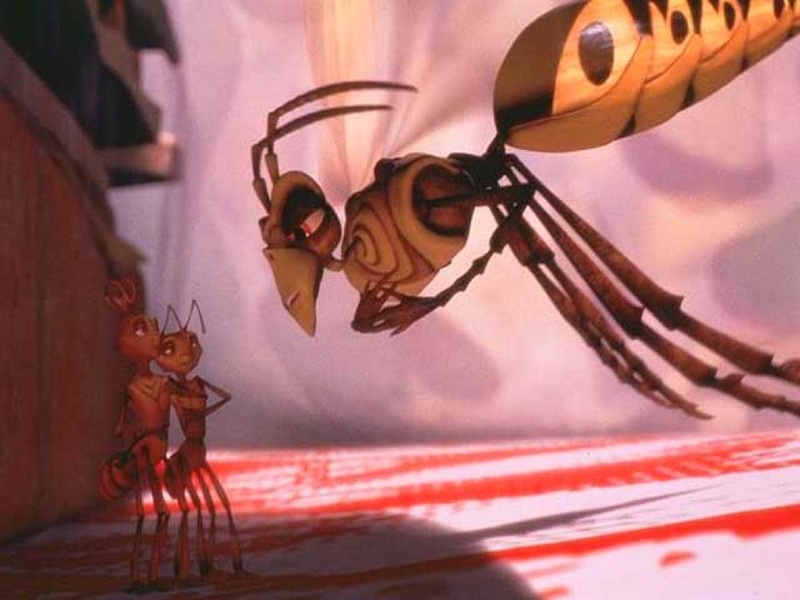 Like "A Bug's Life," "Antz" revolves around a young male drone with eccentric tendencies who vies for a princess's hand by saving their society. A neurotic worker ant named Z-4195, or "Z" for short, is friends with Azteca and Weaver. Z is besotted with Princess Bala, who he meets by chance at a bar. 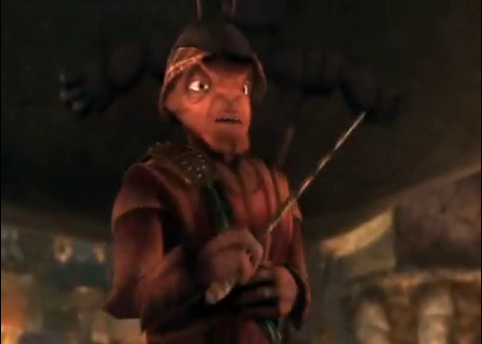 Z wants a chance to meet Bala again, so he switches places with soldier ant Weaver and becomes friends with staff sergeant Barbatus. General Mandible, meanwhile, is engaged to Princess Bala and wants to get rid of all the ants who are loyal to her so that he can build his own army dedicated only to him. Z only realizes at the last moment that Mandible has sent the army to its doom in a battle against acid-shooting termites, and he is the sole survivor. Barbatus manages to encourage Z to question authority before he dies. Returning home, Z is greeted as a hero by everyone, including General Mandible. He meets the royal family, but his cover as a worker masquerading as a soldier is blown by Princess Bala, who recognizes him. This is against the colony's rules and Z faces imprisonment. Panicking, Z takes Bala with him and escapes, then starts searching for the legendary "insectopia," a place where there might be resources to set things right. The act of rebellion by Z excites the colony and leads to a revolutionary fervor. The workers go on strike, and General Mandible sees a chance to use the slowdown in production to solidify his own control. He calls Z a war criminal and proposes a work project, the "Mega Tunnel," which will bring prosperity and restore order. 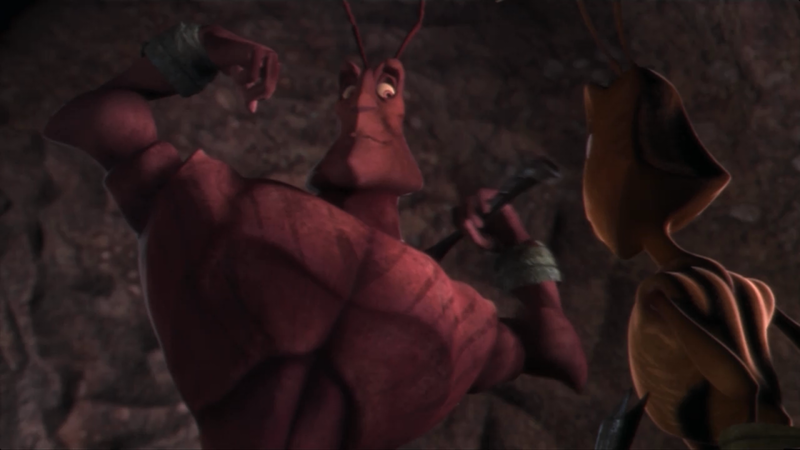 He also knows all about insectopia, and sends his aide Colonel Cutter there to recover Princess Bala and take care of Z. Z and Bala find insectopia, which is a human garbage bin full of delicious human leftovers. Cutter shows up and retakes Bala, bringing her back to the colony despite the fact that she has begun to like Z. Now Z is fired up and teams with wasp Chip to gain Bala's release from General Mandible's office. He then discovers that the "Mega Tunnel" leads to a puddle of water where, once it the last layer of dirt is broken through, everyone in the tunnel will be drowned, including the Queen there to celebrate and all the workers who oppose Mandible. Bala leaves to warn everyone while Z heads to the tunnel to stop the workers before they break through to the puddle and are drowned, but he is unsuccessful. The tunnel is flooded, but Z and Bala organize the workers to create an ant-ladder which will provide a way to escape the rising water. General Mandible, however, is waiting for them above the tunnel. The workers make it to the surface, and Mandible and Z engage in a ferocious fight. Cutter, though, has second thoughts about supporting Mandible against the workers and helps Z to save the ants in the flooding tunnel. Mandible then attacks Cutter but instead falls with Z back into the flooded tunnel. Mandible is killed when he lands on a root, but Z survives. Cutter then takes charge and organizes the rescue of the workers and the Queen. He himself goes down and rescues Z, who is unconscious but revived by Princess Bala. Hailed as a hero, Z marries Princess Bala and leads the colony away from conformity and toward individualism and freedom. 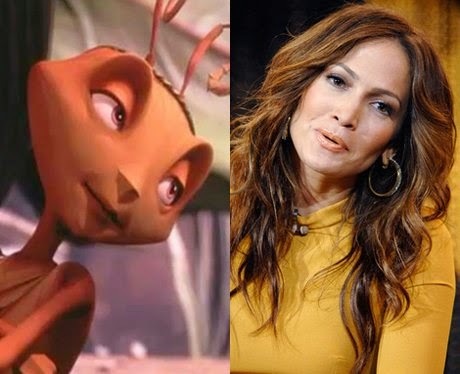 DreamWorks did not skimp on casting for "Antz." Disney had demonstrated the value of celebrity voice actors such as Robin Williams in "Aladdin," and Jeffrey Katzenberg himself had been behind that idea while running that studio. For "Antz" he gathered together one of the best voice casts in animation history, before or since, with many A-listers making their first (and to date only) foray into animation. Woody Allen stars as Z, the nebbishy individualist, while Gene Hackman was appropriately blustery as General Mandible and Sharon Stone was her most seductive as Princess Bala. Sylvester Stone was amiable sidekick Weaver, Jennifer Lopez is Azteca, Christopher Walken by turns malevolent and inspirational as Colonel Cutter, Anne Bancroft as the Queen, Dan Aykroyd as Chip, Danny Glover as Barbatus - the list of celebrities goes on and on. All do exactly what you would expect and completely sell the movie. 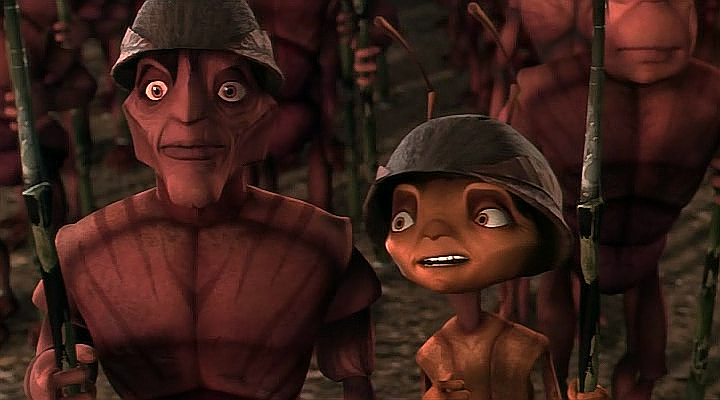 "Antz" is great for what it is, an enjoyable romp in an alien environment with obvious echoes from human society. The animation is top-drawer, and there are lots of chances for the voice stars to hearken back to their famous roles of the past and inject some humor. The story is character-driven, as you would expect with all that high-priced talent. 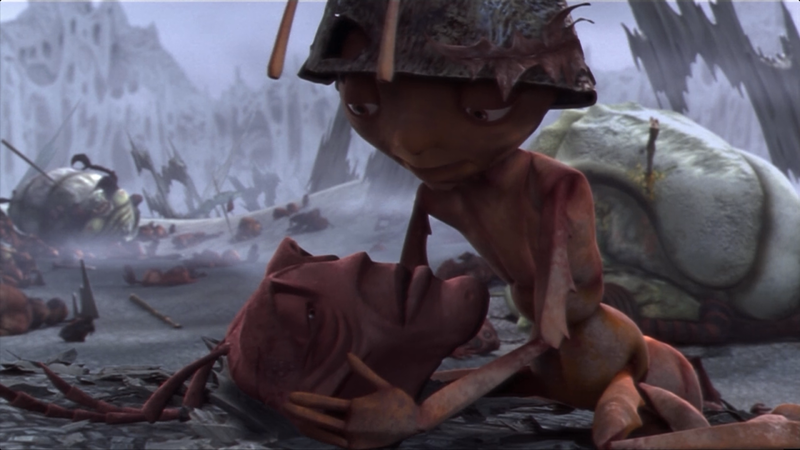 However, "Antz" overall is a dark tale (both thematically and visually) that tackles some serious issues. Let's fact it, any film that broaches, however tangentially, ethnic cleansing is not all light and fluffy. "Antz" simply does not have the bright, sunny outlook (matched by its outdoors locations) of "A Bug's Life," which followed the release of "Antz" but still did better business. Katzenberg thought that the key to the Pixar breakthrough with "Toy Story" was the vivid CGI, but he missed the other half of the Pixar equation, which is a bright, sunny, positive story with lots of situational humor. 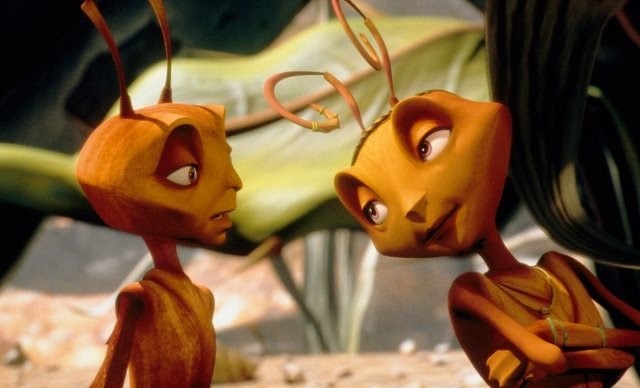 Make no mistake, "Antz" is a lot of fun and merits a viewing regardless of how you feel about "A Bug's Life." 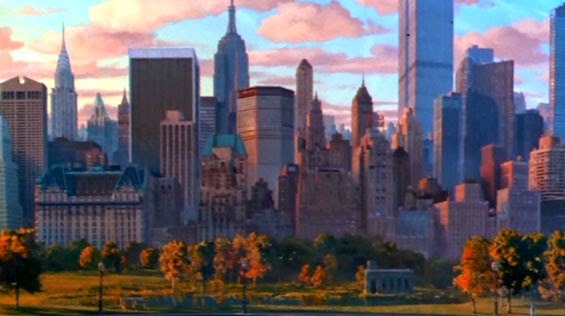 The voice stars are perfectly cast, and Woody Allen creates one of the epic animated characters in Z. The soundtrack by Harry Gregson-Williams and John Powell is serviceable, and the film was a box office success. 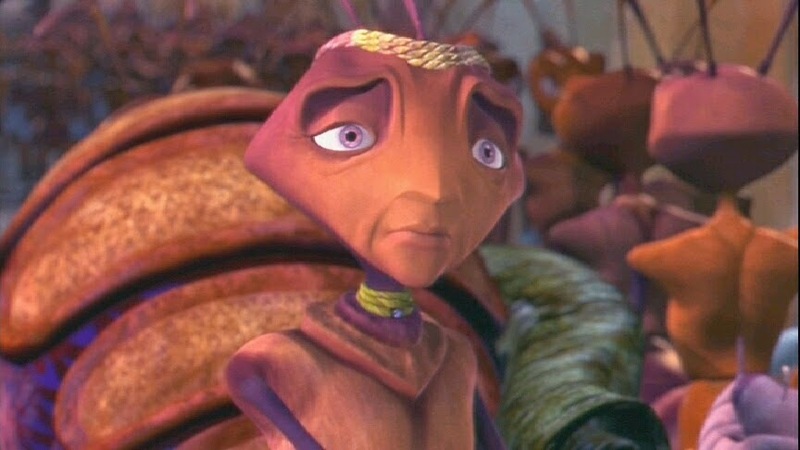 "Antz" remains one of DreamWorks' most popular releases, and the only thing stopping a sequel likely was the impossibility of rehiring or matching the stellar voice cast. 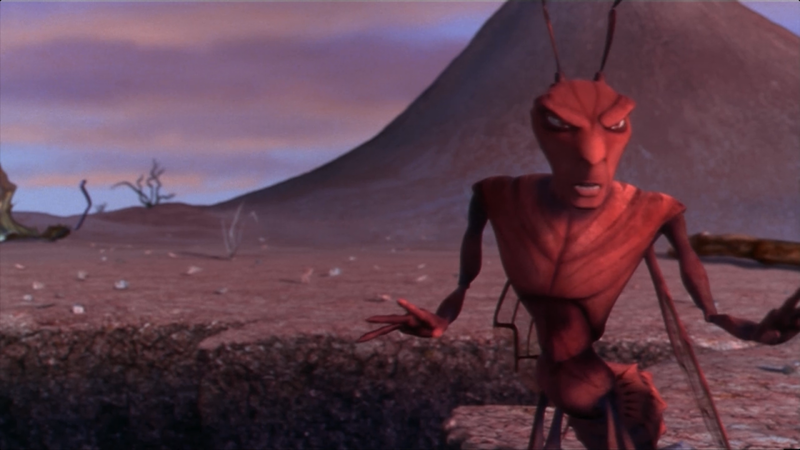 Below is the trailer for "Antz."